Surveying press coverage around blue collar employment over the past several years, it’s often been the case that “blue collar” has in fact acted shorthand for white working class men. The visibility of this specific slice of the workforce has risen significantly since the 2016 election, when these White blue collar voters were frequently cited as key to Trump’s success. The President’s rhetoric too has mixed blue collar advocacy with more specific appeals to the white working class, playing on feelings of societal neglect and increased competition with non-white workers. Our focus in this report is to expand the conversation by examining the racial employment diversity among skilled craft and trade workers, a slice of the blue collar labor market including carpenters, mechanics, plumbers, and more. These are among the highest paid of workers blue collar jobs, and represent something of a gold standard for jobs that do not require an advanced degree. For example, the average yearly income in 2015 dollars for skilled craft and trades jobs was just over $45,000. Compared this to a $24,539 average income for laborer jobs, which perform largely unskilled manual tasks at the same worksites as craft positions. Furthermore, while craft jobs are often characterized by regular full-time employment, laborer and other unskilled blue-collar occupations been increasingly subject to temporary and irregular employment. So who is getting these high paying blue collar jobs? And where are they getting them? Using The Equal Employment Opportunity Commission's 2016 private-sector workplace records, our analyses examine how race, geography, and other factors influence craft employment patterns. Our method involves comparing access to these skilled blue collar jobs in medium and larger private sector firms with the presence of demographic groups within the local labor market to reach an overall level of representation. We identify the Top and Bottom Five states for Black, Hispanic, and White representation within craft and skilled technical jobs. Other groups including Asian/Pacific Islanders and Native American/Alaskan Native did not figure into our analysis due to lack of significant representation in craft positions in many states. Women craft workers are also broadly underrepresented in craft employment, though we will explore some trends related to female craft workers later in this article. So what can we determine in comparing these groups? Broadly speaking, our analysis reveals that the craft workforce is racially diverse and geographically varied, but overwhelmingly male-dominated. While there are a number of patterns at play here, an immediate theme is the overrepresentation of White and Hispanic craft workers and underrepresentation of Black workers. Hispanic workers were employed at a higher rate in 35 states, experiencing considerable lack of access to craft jobs in only Hawaii and Vermont. In North Dakota (228%) and Louisiana (209%), Hispanic men are three times more likely than average to work a craft job. Similarly, White craft workers were employed at a higher rate in 32 states, though with the exception of Hawaii (-43%), these workers were neither over- or underrepresented by more than 25%, indicating a steady level of craft employment nationwide. Black workers by contrast tally above average craft employment rates in only seven states. Even within those seven, only in North (90%) and South Dakota (42%) are those margins wide, driven we believe by the natural gas drilling boom in these areas underway in 2016. The short answer: not working in craft jobs. Nationwide, women are on average 80% less likely to work a craft job than men. Best among states for access to craft jobs for women is New Hampshire with 77% underrepresentation. Most states, however, hover closer to Montana, which posts the worst rate of 93% underrepresentation. Broken down by Hispanic, Black, and White craft workers, women’s representation differs from the racial pattern for men. Hispanic women held the most access (best: New Hampshire at –49%), followed next by Black women (best: Kansas at -62%), and with White women least likely to be employed in craft positions (best: New Hampshire -78%). Low access to employment opportunities for women is by no means an uncommon occurrence; however, among the EEOC’s ten listed employment categories, craft stands out as having the lowest overall representation of women in its workforce. Small and uneven advances have been made in women’s access to craft positions, most significantly with the emergence and mobilization of the Women’s Movement beginning in the 1970s. But in skilled labor fields such as construction, auto repair, and electrical work, cultural, political, and organizational forces have all held back women’s entrance into these jobs. Women continue to predominate, on the other, within “care labor” occupations such as teachers, nurses, child and elder care workers, as well as within service-sector jobs such as waitress, receptionists, and retail clerk positions, all of which are often typified, with rare exception within unionized teaching and health care settings, by low pay and irregular work. In looking at the distribution of craft jobs among states, the trends here seem clearest with regards to White craft workers, whose representation is highest in demographically White parts of the country (the Northeast, Northwest, and Midwest.) Among Black and Hispanic craft workers, these correlations are less apparent. The underrepresentation of Black and Hispanic workers in states like Hawaii and Alaska might have to do with their relatively small populations in these states (as well as the strength of Asian/Pacific Islander and American Indian/Alaskan Native workers, respectively, in craft employment in these states). But this logic doesn’t hold up in several states in which both Black and Hispanic craft workers see the highest representation, including North Dakota (12% Hispanic and 5% Black populations) and Kansas (12% Hispanic, 6.2% Black). Another interesting trend is the dominance of Hispanics within craft employment in the South. Louisiana and Mississippi rank second and third in states with the highest level of Hispanic representation. 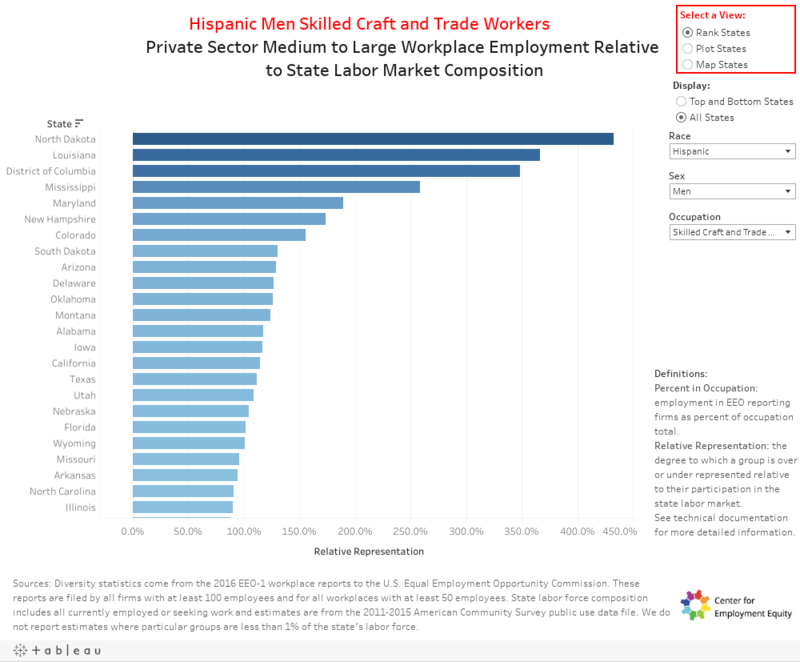 While these two are to some extent outliers, there are also no states in the South where Hispanic craft workers are underrepresented relative to their labor force presence. Craft employment makes up a significant portion of the overall Hispanic labor force in Mississippi and Louisiana, suggesting that these workers fill an important and specific niche, perhaps linked to significant urban building booms in these states in recent decades. One probable explanatory factor at this state level is are the practices of exclusionary old-line craft unions, which exert strong influence on both the hiring and training processes of particularly high-skilled and well-paid positions in construction and other craft sectors. Within the Midwest and Northeast, craft unions have historically been dominated by white ethnic communities, which could explain why four of the top five states for White representation are Northeastern. A second possible factor is the influence of craft employment within workplaces and projects on contract with the federal government. Federal contractors must agree to abide by Affirmative Action and other anti-discrimination policies, and are subject to random audit by the Department of Labor’s Office of Federal Contractor Compliance Programs.. The prevalence of federal contractor employment within Washington D.C. could account for the greater representation of Black and Hispanic craft workers there. Washington D.C. ranks among the bottom 5 for White representation, and top 5 for both Black and Hispanic representation. While far from a clear picture of craft employment patterns, our analysis does offer a more complex version of blue collar labor than typically offered through media coverage. Fears stoked by President Trump and many of his advocates that the White working class are being pushed out of the job market do not seem to apply to craft positions. Further, the growth of this sector of the economy seems to have opened up employment opportunities for Hispanic workers, though Black workers and women do not seem to have secured a representative place in the craft job market. In the interest of employment equity, we offer a few recommendations. Given the strength of union organization where they are present in craft labor markets, we advocate that these organizations double-down on initiatives to recruit and retain new minority craft workers, using the power of the union hiring hall to broaden employment opportunities. Building Trades unions in Massachusetts and other locales have had success in these policies, which play an important part in addressing large anticipated retirement and lack of labor supply in these occupations. These initiatives are an important and effective legacy of the Civil Rights Movement of the 1950s and 1960s1. We also call for a reframing of press coverage of blue collar employment away from a specifically White issue and toward one that advocates for gainful and equitable employment opportunities for all workers. Explore employment diversity beyond craft employment through our data visualizations. 1: Sugrue, Thomas J. “Affirmative Action from below: Civil Rights, the Building Trades, and the Politics of Racial Equality in the Urban North, 1945-1969.” The Journal of American History, vol. 91, no. 1, 2004, pp. 145–173. JSTOR, www.jstor.org/stable/3659618.